Fife no more. OK so that's a bit melodramatic, but the vehicles, services and property of Stagecoach Fife are quite different to those of its predecessor Alexander(Fife) 30 years ago. Of course Vikings, Lodekkas and Leopards have long since disappeared, but so too have several bus stations, some historic routes and a good few company premises. The latest depot to close was that on the esplanade at Kirkcaldy, for so many years the head office of Alexander(Fife), which shut in October 2004. Here we remember some other aspects of Fife that are no more. After Alexanders was split in 1961, Fife was left with ten depots. Gradually these have been whittled down to just five with the former head office at Kirkcaldy closing in October 2004 (above middle). Other depots that have closed include Anstruther, Cupar, Kelty and Lochgelly (replaced by Glenrothes). Newburgh located by the banks of the silvery Tay was one of the last small depots to close in the late 1980's. In this view (above right) half the fleet is seen at dusk. The depots at Cowdenbeath, Dunfermline and Glenrothes remain in use as do those at St. Andrews and Aberhill (left) sometimes known as Methill but located in Leven. One of the longest stage services in Scotland was the (14) from Glasgow to Dunfermline via Kilsyth. Taking almost three hours from end to end, it required six vehicles from four depots and two companies (Midland: 2 x Stirling, 2 x Kilsyth, 1 x Alloa; Fife: 1 x Dunfermline). 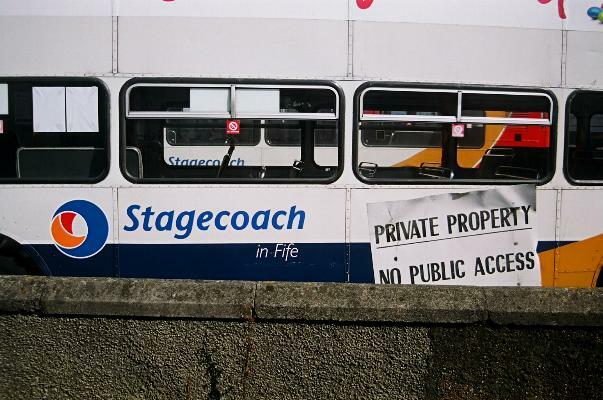 With the advent of European legislation on driving hours, the service was cut in two at Stirling from the mid 1990's. Now renumbered the (24), three First vehicles operate the Glasgow to Stirling section and two First and one Stagecoach Fife vehicle operate the Stirling to Dunfermline section. The Fife representative on the route during the 70's and 80's was usually Alexander bodied Leopard FPE91. Here sister FPE90 (YSF90S) is seen deputising in Kirkintilloch in December 1985. Some towns in Fife unbelievably had two bus stations including Dunfermline (above) which is now a car park, and Leven (left and below left) which is now housing. The second bus station in Kirkcaldy became the main one after The Esplanade (below middle) was closed in the early 1980's. One notable exception is Glenrothes which has gained a bus station (below right). The bus station in St. Andrews has remained much the same for many years (bottom). St Andrews is unusual in that its bus station is located on the garage forecourt. Here a Newburgh vehicle (below right) loads on the (23) for Stirling, a route that used to run through to Glasgow until the Scotmap changes in 1981. A Northern Counties bodied Olympian of Stagecoach Fife at Kirkcaldy depot in August 2004. Aberhill depot in August 2004. FPE64 (HSX64N), an Alexander bodied M-type London coach at Kirkcaldy depot in September 1978. FPE90 (YSF90S) in wintry Kirkintilloch in December 1985. St. Margarets bus station in Dunfermline is now a car park; FNV28 (HXA28E), an Albion Viking in bus livery is seen heading for Crombie in July 1977. Parkhill bus station in Leven is now housing. Fife were the only SBG company to by ECW bodied Bristol REs, a staple of the NBC. FE29 (JXA929F) is seen at Kirkcaldy esplanade bus station (now a car park opposite the bingo hall) in September 1977. Volvo Ailsa FRA67 (A967YSX), in scenic Glenrothes bus station in September 1987. St. Andrews bus station now and then; 232 (GSG132T) about to depart for Stirling in April 1988. There has never been a warm welcome for enthusiasts at Fife depots. Even in the pre-hysteria days, it was impossible to take out a notebook in Kirkcaldy depot. A rather posh fish restaurant with starched white tablecloths and well-heeled customers. All food (including the delicious bread) homemade. Picturesque setting.